Born in Hawick, Scotland,she studied at Barnet and Loughborough College of Art and Design obtaining a BA (hons.) degree in 3-Dimentional design with Silversmithing and Jewellery as her chosen subjects. She has been designing and making jewellery for the past 25 years and has contributed to many important exhibitions including Goldsmiths Hall and The Mall Galleries. She has always been aware of the importance of drawing and has continued with this and oil painting alongside her Jewellery making and Design. She enjoys travelling and her paintings are a record of various places she has visited including Venice, Spain, London and Paris. Elaine prefers to work directly in front of the subject capturing the essence of a place as she sees it, conveying mood and images others may not have noticed. 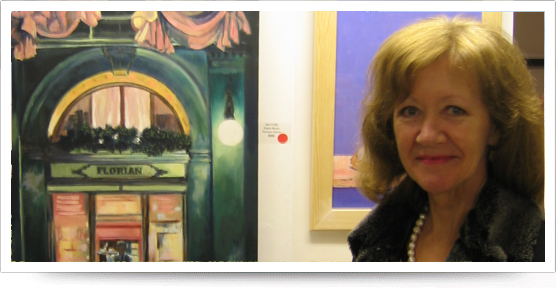 Collections of Elaines work can be found in UK, Spain, Germany, Italy, Ireland,Moscow and Australia. © 2019 Elaine Moore. All images on this site are subject to copyright and cannot be used without Elaine Moore's permission.